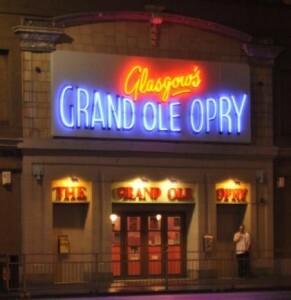 The Grand Ole Opry is situated in Glasgow in the West of Scotland at Paisley Road Toll on the south side of the city’s River Clyde. 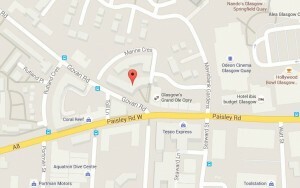 Address is 2-4 Govan Road, Glasgow G51 1HS. It is on the main bus routes and can be reached easily by taxi or public transport. The location is within walking distance of two local budget hotels* and by the Underground to Shields Road Subway station from the city centre where there is a choice of more expensive hotels. 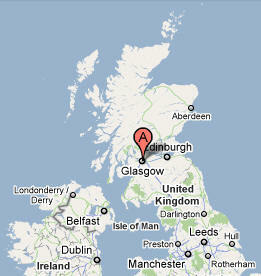 If you are travelling by car, the Grand Ole Opry is also situated close to the M8 and M74 Motorways. Follow signs for Kinning Park & Tradeston. Exit at Junction 1 and take right-hand traffic light to Tradeston. Straight ahead in Local lane, through next traffic light and follow road past Co-op building, taking left-hand turn into Paisley Rd at next traffic light. Go straight ahead at next set of lights and the Grand Ole Opry is approx. 50m on the right. There is no official car park but there is a limited number of spaces at the rear of the building (enter via Marine Crescent from left approach, otherwise via roundabout in Govan Rd, taking 3rd exit into estate and follow road along to Marine Crescent, turn right approx 20m from traffic light, to rear of Opry building) and in the surrounding streets. A ramp is available at the rear of the building for wheelchair access.